"To assist RNZIH members who are bone fide full or part time horticultural students with the costs of attending seminars, conferences or workshops that are being held within New Zealand." The Memorial Prize Fund is made up from a number of previous RNZIH awards. These were: Rita Skellerup Prize, David Tannock Memorial Prize, Dugald McKenzie Prize, Junior Memorial Prize. Any financial member of the RNZIH who has been a member for a minimum period of one year and who is a registered full or part time horticultural student at an institution in New Zealand. It is expected that the member would make a contribution towards the cost of attending the seminar/conference/workshop to demonstrate their commitment. The RNZIH will consider applications for up to 75% of the cost of attending, including travel, registration and accommodation. Successful applicants must provide evidence of attending by way of receipts or other papers following the event. Failure to comply with this condition the applicant shall be liable to refund all award moneys to the RNZIH. The National Executive of the RNZIH reserves the right not to make an award if in its opinion the application is not of sufficient merit, or for any other reason National Executive may decide from time to time. Applications should be submitted at least two months prior to the conference, seminar or workshop. "To assist with the conservation of the exotic and indigenous plant resource in New Zealand"
The Scholarship will be granted for research field work, publication, propagation, protection and/or cultivation of plants, production of educational resources, and any other activity likely to promote and assist the conservation of New Zealand's indigenous and exotic plant genetic resources. The main criterion shall be the value of the work in conserving a plant or group of plants, especially those that are threatened. Plants include trees. Applicants must be New Zealand residents or citizens. The Scholarship may involve travel and/or study outside New Zealand. However, the work must be of benefit to the plant genetic resource within New Zealand. Applications must be typed on the appropriate form obtained from the Institute and lodged with the RNZIH no later than 31 March. A synopsis of the proposed project must carry a statement of support by an acknowledged authority on the topic. Late applications will not be accepted. "Persons who have rendered distinguished service to horticulture"
For Associate of Honour of the Royal New Zealand Institute of Horticulture AHRIH(NZ). Nominations are active and considered for three years. Nominees need not be members of the Institute. Nominations can be made by Branches, national Executive or by Associates of Honour (do not approach the person being nominated). Special conditions indicating distinguished service to horticulture. "Members who have made a significant contribution to horticulture by their activities or interest in or service to horticulture"
For Fellow of the Royal New Zealand Institute of Horticulture (FRIH). Nominations are active and considered for three years. Nominees should be members of the Institute. Nominations can be made by branches or by National Executive (do not approach the person being nominated). The Award is granted to any nominated individual or organisation who has raised in New Zealand a cultivar considered to be sufficiently meritorious. The Award shall consist of an inscribed medal. A cultivar is a cultivated plant which is distinguished by any characters significant for the purposes of horticulture and which when reproduced sexually or asexually retains its distinguishing features. The term 'cultivar' and 'variety' are synonymous for this award. the cultivar should have been registered if it belongs to a genus registered by an International Registration Authority. Nominations can be made by a Branch or by National Executive, any horticultural organisation affiliated to RNZIH, or any incorporate horticultural organisation. The aim of the award is to help focus Institute support for horticultural history and the conservation of cultivated plants, promote public interest in horticultural history and conservation, promote public awareness of the Institute, and encourage cooperation with other bodies such as the Historic Places Trust. The award is granted to any nominated individual or organisation within New Zealand making distinguished contributions to horticultural history and conservation. 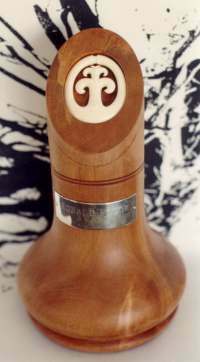 The award is an inscribed medal similar to the Plant Raisers' Award. The contributions may include scholarly publications on any aspect of horticultural history or of the development of cultivated plants, studies on individual gardens, horticulturists or plants, projects on the conservation of cultivated plants, projects involving the conservation and/or restoration of gardens or garden structures. Nominees need not be members of the Institute. Nominating bodies are the national Executive, any branch or affiliate of RNZIH, any incorporated horticultural organisation, or the Historic Places Trust of any branch thereof. Awarded annually to a young person who has demonstrated an outstanding plant knowledge. The recipient receives a certificate plus monetary prize. The purpose of this scholarship is to assist people to undertake further study or obtain practical experience in amenity horticulture, ornamental horticulture, nursery management or any other closely allied field. Applicants must be between the ages of 19 and 35. They must have been resident in the South Island of NZ for at least two years prior to commencement of study. They must have completed a qualification in Horticulture or related area of study. The value of the award is up to $4,000. The Scholarship Manager, P.O. Box 85084, Lincoln University, Lincoln 7647, Canterbury. Link to Award details administered by Lincoln University. This NZ Arb Award was established in 1994. The Award is to elevate the good practice of Arboriculture, including tree raising, tree health, management and amenity tree protection. The recipient will have demonstrated a deep empathy with trees, whether functional or aesthetic in any stage of development. NZ Arb have named this award after the late Nelson based Landscape Architect Ron Flook for his high standard of aesthetics and the effect which he creates with trees in his landscape designs. The successful nominee receives the gift of a bone carving by Bill McIntyre of Blenheim and loan of the trophy for one year together with a cheque for $250. The Secretary, NZ Arb, P.O. Box 5596, Wellesley Street, Auckland. "Offered to lovers of nature in New Zealand to encourage the protection and cultivation of the incomparable flora of the Dominion"
The Cup was donated by Gerald W. Loder (later becoming Lord Wakehurst) of Sussex, England, in 1926. The cup is to be presented to lovers of nature in New Zealand for annual competition under such conditions as might be approved by the Minister of Agriculture, in whose custody the Cup was placed. (Ministerial responsibility now rests with the Minister of Conservation).